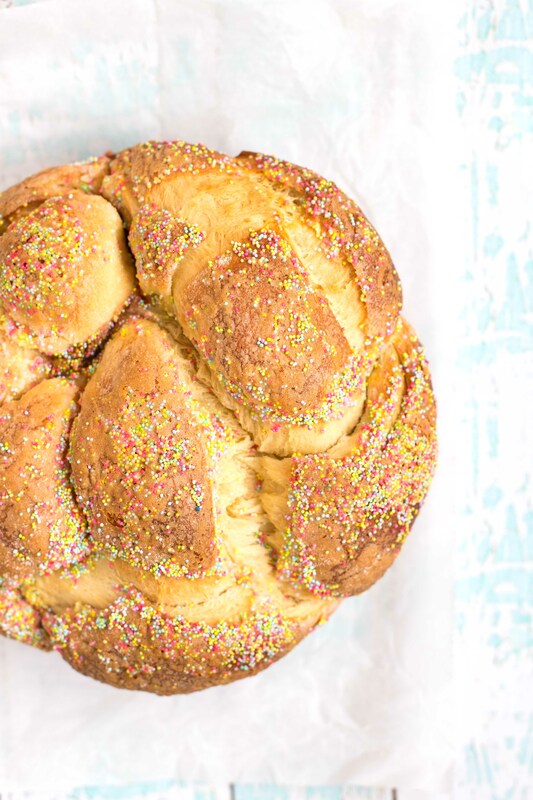 Every year my mother and I make sweet bread for Easter – my mom’s standby recipe is this one and over the years I’ve tried out a bunch of different recipes. 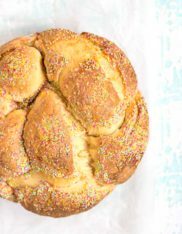 My favorite, however, is Mira from Cooking LSL’s Bulgarian Easter Bread. The outside has a delicious sugary crust and the inside is tender, stringy and pulls apart beautifully. Mira flavors hers with lemon zest but you could alternatively flavor it with orange zest or my personal favorite is the spice mahleb. Mahleb is a very mild spice that’s used in a lot of Middle Eastern baked goods and it’s very unique and so tasty. It’s made from the seeds of a specific cherry stone and it’s ground into a fine powder. It’s very hard to describe the flavor but once you’ve tried it you’ll crave it. You can find it at Middle Eastern bakeries and markets and (of course!) Amazon. There are always so many things I want to have on certain holidays or celebrations but there’s only so much time you have to prepare things. So, again, Easter Sweet Bread is something that I like to make ahead of time when I’m not pressed for time and I freeze it freshly baked. When I take it out on Easter it is still fresh and delicious. Obviously, there’s nothing quite like bread that has just come out of the oven but this is also really, really good. If you’ve never made bread from scratch before this is a good recipe to try because it only requires one long rise and the dough is easy to work with and roll out. I hope everyone has a wonderful Easter holiday! In a small bowl or measuring cup, combine 1/2 cup lukewarm milk, yeast and 1 tbsp sugar - cover with plastic wrap and set aside for 10 minutes (this allows the yeast to bloom and should become foamy on top). *If your yeast does not bloom that means it is not active - check the expiration date on the yeast or your milk could be too hot. In a large bowl, sift together the flour, salt and mahleb. In the bowl of your stand mixer fitted with the whisk attachment, whisk together the sugar and eggs until the sugar is dissolved. Add the vanilla and milk and half of the oil, mix to combine. Add in yeast and milk mixture and whisk to combine. Gradually add the rest of the flour on and increase speed to 4-6. Add in the oil in 2-3 parts allowing it to mix in each time before adding more. The dough should be soft and sticky. Transfer the dough to a lightly oiled bowl and cover completely with plastic wrap (make sure the plastic wrap is touching the dough). Place the dough in a warm place away from drafts and allow to rise for 2-3 hours (until it has doubled in size). Prep the egg wash by combining the egg yolk, oil and milk and set in the fridge until later. Preheat oven to 375°F and oil and flour a round 9" cake pan - set aside. Once the dough has risen, divide it into three equal parts and roll it into three long cylinders approximately 16" long. Braid the dough and place it into the round pan in a circular braid - pinch together the ends to complete the circle. Cover the dough with plastic wrap and allow it to rise again for 15 minutes. Brush the braided dough with the egg wash and sprinkle generously with sugar and nonpareils. Bake for 10 minutes at 375°F and then reduce the oven temperature to 350°F and bake for an additional 30-40 minutes. Check the doneness by sticking a toothpick into the center, it should come out clean when it is totally cooked. If you need to continue to cook the bread but it is golden , just gently cover it with aluminum foil and continue to bake until the toothpick comes out clean. Allow the bread to cool for 10 minutes in the pan and then transfer to a wire rack to cool completely. Recipe slightly adapted from Cooking LSL.